Posted on March 4, 2013 by Susan H.
Wrapped up in the tea towel…they were still a bit warm when I arrived…they loved them! The Dairy, Egg, Soy and Peanut/Tree Nut Free Oatmeal Blueberry Muffins I had planned to bake would have been just a bit too messy for knitting…raisins were the perfect compliment for a cinnamon oatmeal muffin. I prepared all the dry ingredients, the ‘flax egg’, placed all the paper liners in the muffin tray and had my measuring cups and spoons all at the ready for baking the muffins first thing in the morning. I sprinkled some whole oats over the top with a few extra raisins before popping them in the oven…love when they get all toasty and brown. 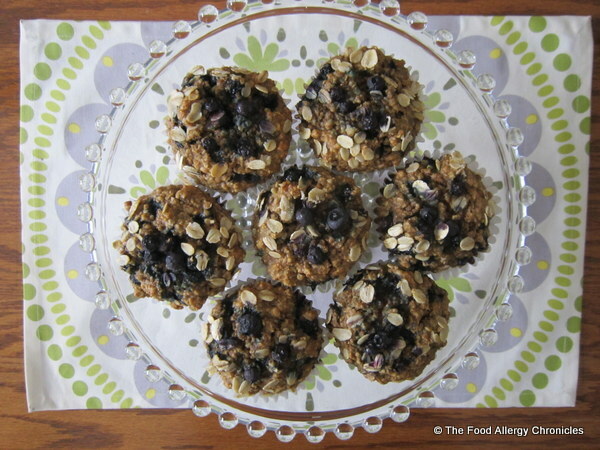 Click here for my adapted recipe post…just replace the blueberries for raisins. Delish! 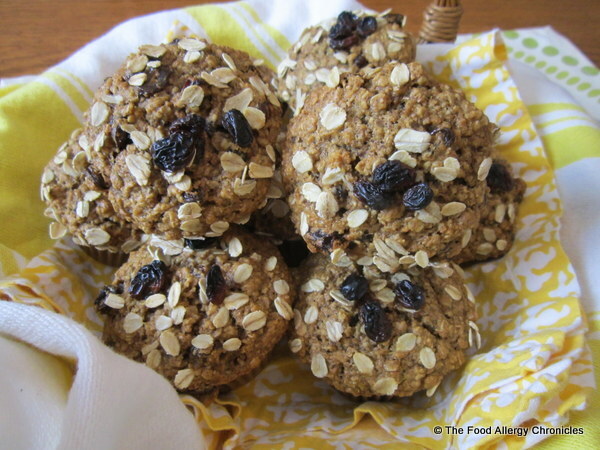 Tip: I realized at lunch-time, while perusing the refrigerator, I had forgotten to add the ‘flax egg’ to my batch of Dairy, Egg, Soy and Peanut/Tree Nut Free Oatmeal Blueberry Muffins yesterday morning…these have now become my favourite go-to morning muffin! Not to worry…it went un-noticed until the discovery. Although, I did wonder why they seemed to be missing their nice and crispy ‘puffy’ muffin tops…my favourite part of the muffin! This past Saturday, the lovely ladies and I gathered once again, to start our third and final lesson of the beginner knitting series at The Kniterary…a baby sweater. At the end of the lesson, I felt a bit overwhelmed with this project. However, I know if I take my time…that would be, taking one step at a time, taking deep breathes then counting to ten and then adding one (my knitting neighbour’s husband’s advice)…I know I will slowly but surely knit my way to accomplishing an adorable baby sweater. There were four of us in Saturday’s class…three of us have been together since the start…knitting a scarf in our first session and then a hat in the second…our fourth knitter joined us in the second session. I am still ‘plugging along’ on my scarf/cowl…with my knitted hat complete, I wear it everyday! I was happy to discover one of the knitters brought her completed knitted scarf and hat combo. 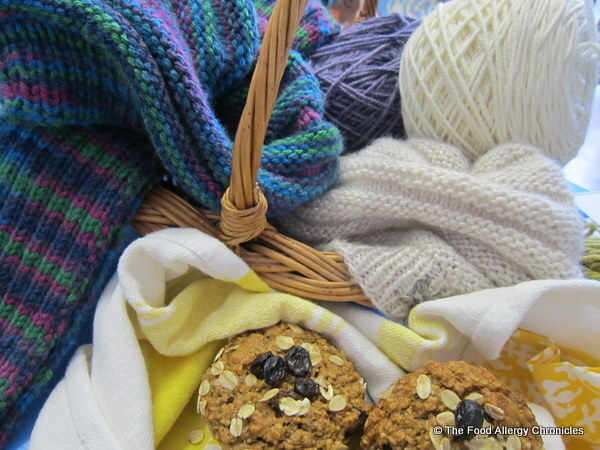 With next week’s lesson cancelled due to the March Break…I have an extra week to work on my project and…to create a final allergy friendly muffin/treat for all the lovely ladies at my knitting class! Despite the times of feeling frustrated trying to remember all the different techniques with knitting…I am enjoying the therapeutic nature of the knitting process. I am so happy to have been introduced to knitting as an outlet to relieve some of my stress while, at the same time, encouraging my creative side to ‘step out of the box’ into a new medium. What types of hobbies and/or extra-curricular activities do you participate in to help relieve some of your everyday stress with food allergies, eczema and/or health concerns? What benefits have you noticed? Please share in the comments so we may all learn new ways to cope. This entry was posted in allergies, baking, breakfast, dairy free, egg free, muffins, multiple food allergies, oats, peanut/tree nut free, soy free and tagged beginner knitter, Dairy Egg Soy and Peanut/Tree Nut Free Oatmeal Blueberry Muffins, Dairy Egg Soy and Peanut/Tree Nut Free Oatmeal Raisin Muffins, Kniterary by Susan H.. Bookmark the permalink. I love reading your blog first thing in the morning with my morning coffee! Thanks for posting nice and early in the day. It gives me inspiration while I still have some energy. All I can say, is any group is lucky to have you and your wonderful treats! As far as dealing with stress, I really like spinning classes (easier on my legs than running, allowing a much better workout as far a cardio), reading, and working on my cooking skills. I’ve always admired knitting results, but have a feeling I’d better try something easier first!